Sky Food Catering strongly promotes eating well by using fresh, locally sourced foods at each of its client facilities and this makes quite an impression. We create chef-inspired menu’s with high quality ingredients. Flexibility with menus involves everyone onsite. We like to incorporate menu items that satisfy every employee. Usually, if one person asks, it’s something that more people want, we will put it on the menu if its popular, we keep it on and we’ll rotate it around. 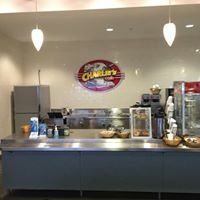 The company now has onsite micro markets where employees can get fresh grab-and-go food and retail items such as power bars, chips, other snack foods, and beverages after hours. The self-checkout area with the additional snack foods lets people pick up stuff after hours, after lunch is over, or even on the weekends, then scan it, and go. It’s a significant change and the mini market is well-used. As a food service company, we believe it is our responsibility to be a conscientious partner. To provide the highest quality food, it is paramount that we start with only the best, most responsible providers. This means using local, sustainable and trusted partners that are fully invested in our vision. But it doesn’t end there. Our chefs are on a mission. That mission is to use high quality ingredients that are prepared with loving care. We want to showcase the beauty, art and tantalizing flavors of the freshest ingredients from local resources. It is our sincere hope that by using our talents in the kitchen, we can encourage a community to view the food around them differently. Open people up to new flavors. Something new. Something that was right in their own backyard. As a premier food service management company, we break the mold to add value. We don’t believe in initiating change for change’s sake. Instead, we try to change the process, add value, and move people forward. Let us know how we can serve your food service needs. We are here to take your corporate dining environment to the next level. Our program is designed to assist people with making the better choice for long-lasting health benefits. Through our delicious food, enticing menus, choice architecture and gentle price nudging, we have found that over time, we can influence habits and help people make better choices that affect their daily performance as well as their overall health. Engaged employees strive to bring their best work to the table. They are constantly creating and reaching for further success. 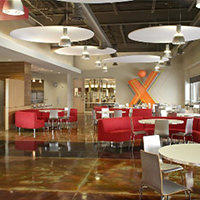 The corporate cafe offers a unique opportunity to drive productivity and influence better performing teams. The services keep people on-site, collaborating with colleagues and can increase overall satisfaction in the workplace. Using strategic marketing and fun promotions, your cafe festivities can captivate your employees and keep things fresh. But when it comes down to really increasing participation, our food is the showstopper. We have proven that when we take over a cafe that previously did not have a fresh, delicious food focus, we can increase the participation by 30%. Sky Food Catering offers clients maximum flexibility by enabling customization of the food service to their specific needs, such as organic options, micro markets, off-site kitchen and so on, in contrast to national corporate food service companies with inflexible tiered service offerings. The facility director appreciates the support he/she receives from both culinary and executive management. Corporate support is always available. If our employees have a question, it’s just a quick text and they will have an answer within minutes. The president of Sky Food Catering is usually onsite every week to see how things are going. What is best about working with Sky Food Catering? 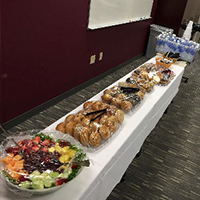 When asked to choose the best aspect of working with Sky Food Catering versus other vendors, one facility director said, “We are very pleased with their service. They have a lot of good ideas, innovation, and they get us whatever we ask for. They are being honest and open about everything. In the large food service vendors, you don’t see a lot of that. That really sets them apart for me.” – C.H Robinson Worldwide, facilities director.